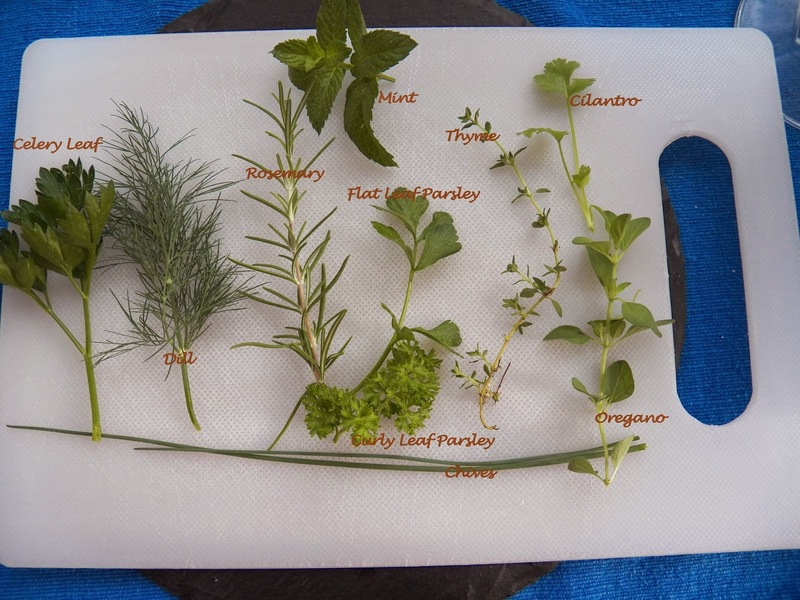 I was loving the whole idea of being able to go outside and pick fresh herbs for the Herbie Chicken I did last week. It felt wonderful, just knowing I had all those great flavours growing in my little backyard. And when I say little backyard, I'm not kidding. It's all of 7 feet wide, and bricked. But I have pots and pots and pots of stuff growing. And when I went outside just now I realized that I don't have a lot of flowers, most of my pots contain herbs. Gee, I wonder what that says about me? Apart from the fact that, most herbs like not being in direct sun to grow, and my backyard is a little shady. I have a Meyer Lemon tree, in a pot, which produced a lot of lemons last year, but this year, it's not doing too good. But, it's OK if it wants to take a year off from producing. I'll just keep feeding it, and watering it, and removing the little pesties that invaded it this year. I also have some violets which I brought with me from our first house, many years ago. I love how they smell when they bloom. And you know, you can candy the violets if you want to. In fact there is even a liqueur that is made from violets. I think I'm getting ideas here. I have Rosemary, which has lasted for a year now. I hasn't killed it yet. Dill, was just a little sprig when it started. And I'm going to be using it a lot this year. Chives, which need to be repotted or planted in the dirt, but in the meantime, I raid them on a regular basis. Parsley, which also need to be repotted or something, I need to pick some of it and freeze it before the swallowtails get to it, and eat it all gone. Mint, which did escape and one of the long runners rooted in a pot where I have some lemon trees growing. Oregano, and I think I can start harvesting and drying or just chopping and freezing it now. Thyme, another herb which can be harvested and dried, or maybe harvested, and frozen in little olive oil blocks, hmmmm. Celery, which I started from the base of some celery I'd used a couple of months ago. I grab the leaves and chop them up for flavour. And out front I have some Heirloom tomatoes, Anaheim Peppers and more Parsley. Gotta plant lots of that for the swallowtail and monarch butterfly caterpillars. Just need to plant some Basil, maybe some Chervil, but that has to wait for fall, Chervil doesn't like hot weather. And I need some Sage, otherwise how can I sing? Never mind, I need to go water something now.